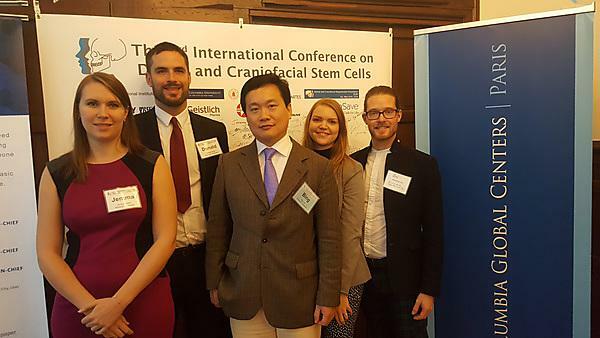 A delegation of dental researchers from Plymouth University Peninsula Schools of Medicine and Dentistry (PUPSMD) has played a role in the 3rd International Conference on Dental and Craniofacial Stem Cells, held recently in Paris. The group was led by internationally-recognised dental scientist Dr Bing Hu. Dr Hu was one of the key speakers at the conference. His presentation was entitled “Molecular control of tooth epithelial stem cell maintenance and transition” and covered the role of dental stem cells in the regeneration of teeth. His research in Plymouth covers three main areas: oral cancer and stem cells; hair development and skin cancer; and craniofacial development and tissue engineering. Dr Hu was accompanied by four PhD students working in the field of dental and craniofacial research at PUPSMD – Jemma Walker, Donald Singer, Portia Grayson and Jonathan Davies.